Next up in IoT exploration is the Sparkfun ESP8266 Thing – part WRL-13231. Note that this is not the Dev board – a separate device with different pinout and other changes. Navigating Sparkfun’s hookup guide was fairly easy, especially since I had already installed the ESP8266 libraries as part of another project. The example they walk through on Sparkfun’s site shows you how to set up a basic, localized server. All of the other ESP8266 experiments I’ve done up to now were designed to make a device connect to an existing network, so this was a nice change. Web server accessible from my Android. 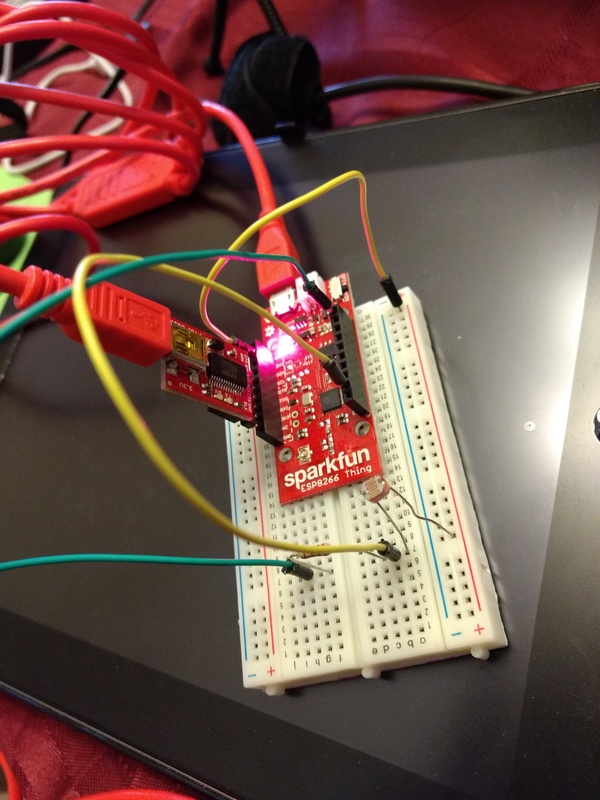 Having experienced the easy connection of Particle Photon and the NodeMCU boards, using the FTDI Basic module to program the Sparkfun Thing was a bit odd. I had an FTDI module on hand from a previous project, but it had female headers soldered onto it. So I had to use a 6-pin male-to-male header to make the connection. This overly complicated connection may have contributed to some of the wonkiness with uploading my sketches, though uploading is also a known issue with this board that Sparkfun addresses in detail on their site. The web server example went by pretty quickly, so I went over to Hackster.io and found a light sensor project to try. This too was pretty easy. Yeah, not terribly exciting on the surface, but this is something that took way more hardware to pull off even a few years ago. I like the fact that the Sparkfun Thing has a power switch onboard. The JST battery connector is a bit fragile, so I could see that having to be repaired or replaced with rough handling, especially if that was the only way to turn it on/off. Still not crazy about the FTDI, but I can deal with it. Going to consider how I can pull this device into my ecosystem of other similar devices. Probably need to play with some other sketches. Also interested in trying the sister board. It seems there are more projects on Hackster.io for the Dev board than the one shown here.